Chanteuse Country US née Gloria Jeanne Black, le 25 Octobre 1937 à Pomona (Californie). 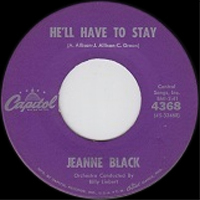 One-hit-wonder Jeanne Black scored a Top Ten pop and country hit in 1960 with an answer song to Jim Reeves's "He'll Have to Go" called, logically enough, "He'll Have to Stay." 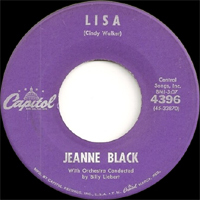 The California-born Black began her career in 1956, appearing as a singer on Cliffie Stone's Hometown Jamboree TV show. After leaving Jamboree in 1959, she performed in Las Vegas and at Lake Tahoe before teaming up with Billy Strange. Black signed to Capitol the following year, where she released her one big single. Though it was a great success, she was never able to follow it up with anything substantial. 1960 SP CAPITOL 4456 (US) . You'll Find Out / ? 1961 SP CAPITOL 4566 (US) . Jimmy Love / ?